Cats have a habit of lying in the most inconvenient places. 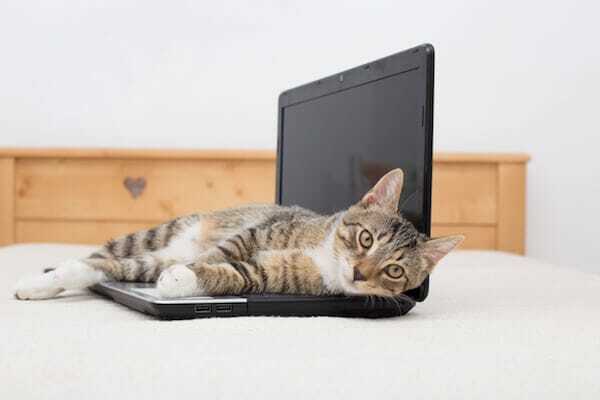 Be it a laptop, your latest book, a drawer — and of course their favourite (and perhaps the most inconvenient) place to take a quick nap is on you. But it turns out our fluffy friends aren’t just doing it to be annoying — there are several reasons why they love to sprawl out on top of you. Firstly, don’t forget that cats are wild animals who are used to having to stake out their territory. Lying on your stuff is a way of claiming the spot. And the higher up it is, the better, as this is where they would hide in the wild — hence why your laptop or note pad is more appealing than the desk itself. You'll notice your cat will mark your stuff by rubbing its face and paws on it to transfer their pheromones. If there's a spot of sun, a cat will find it. They love to be warm and will quite happily spend all day lounging outside soaking up the sun's rays. Come night-time, they need a suitable replacement — this is where you come in. Lying on you is super comfy and helps to keep their body temperature raised — you’re basically their own personal heater. Your cat curling up on your lap also shows they feel safe around you and trust you enough to let their guard down. Cats sleep for 15 hours a day or more, so naturally they’re looking for a comfortable spot to carry out their favourite activity. Whether it be on a couch or stretched out in a laundry basket, cats require a soft and cosy place to snuggle up. Your lap is a great option — it’s the perfect size and very warm — add in a soft blanket and you immediately become the cosiest place on earth. Yes, your cat does love you (even if they’re not always so forthcoming in showing it) and cuddling up on your lap is proof of this. Other signs of kitty adoration include head butting of your face, purrs and nose kisses. When your cat shows these signs of affection make sure you return the sentiment and stroke them gently until they fall asleep. Your cat finds the natural sounds of your body incredibly soothing when they sleep on top of you. The steady rhythm of your heartbeat as well as the rise and fall of your breathing helps lull them to sleep. Your smell is also pleasant as your cat associates it with you and the care, companionship, and safety you provide them.